For a change of pace, add snow. The nearby Monashee Mountains boast consistent amounts of light, dry powder snow that challenges every level of downhill enthusiast. 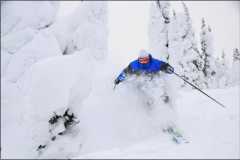 Two ski resorts within a short drive from the City (Big White Ski Resort & SilverStar Mountain Resort) offer a wide selection of amenities beyond the major attractions of skiing or snowboarding. Big White Ski Resort is the closest to Kelowna and is considered by residents to be the local mountain. Winter is a great season in the Okanagan and cross-country skiing enthusiasts will enjoy the serenity of our wilderness. In addition to the trails available at the major ski resorts, Kelowna has several active cross-country ski clubs that maintain upwards of 100 kms of groomed trails, that are easily accessible.